I am AIPAC Culture Jamming! The American Israel Public Affairs Committee (AIPAC) is set to hold its annual policy conference in DC starting on March 2. CODEPINK: Women for Peace is organizing Boycott AIPAC protests all day and you should come out to send the message that the U.S. should no longer support and fund Israel's occupation and apartheid policies towards Palestinians. RSVP here! Watch and share this offensive video promoting the AIPAC policy conference. Click here to post on Facebook and here to tweet to your followers. 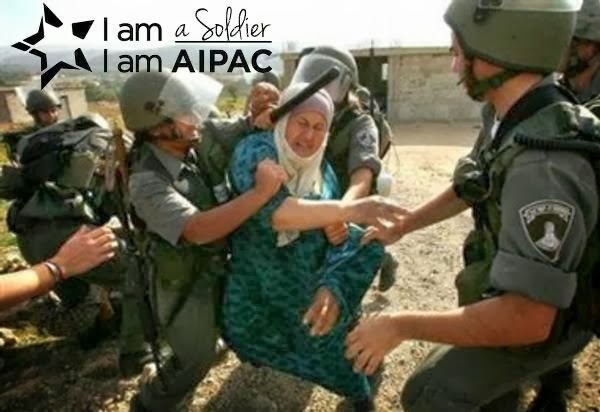 Create and post an "I am AIPAC" sticker. AIPAC is asking its supporters to demonstrate how broad and diverse its membership is and to show their commitment to the pro-Israel movement. This is a great opportunity to expose what AIPAC actually supports: occupation, apartheid, colonization, and overall Israeli oppression of Palestinians. Click "Choose a Photo" and upload an image that highlights Israel's brutal treatment of Palestinians. Choose your "I am..." from the list provided. Submit the photo then save it and send it to membership@endtheoccupation.org so we can collect them and share on our Tumblr! If you are on Twitter, tweet your sticker using #AIPACPride and #AIPAC14. Disgusted by AIPAC's (American Israel Public Affairs Committee) moves to bring us to war with Iran? Sick of seeing U.S. tax dollars fund Israel's occupation and apartheid policies towards Palestinians? Inspired by all the boycott, divestment, and sanctions (BDS) victories happening left and right? Then join us and CODEPINK: Women for Peace for a day of protests! Next month AIPAC will be holding its annual conference at the Washington DC Convention Center on Sunday, March 2. We will gather outside to protest the U.S. policies pushed by AIPAC including unconditional support for Israeli oppression of Palestinians. There will be actions happening all day from 8:30am-8:30pm. RSVP here! There will also be a special event from 2:00-4:00pm. If you can make this action at 2:00pm, please email Sara sara.codepink@gmail.com to sign up! 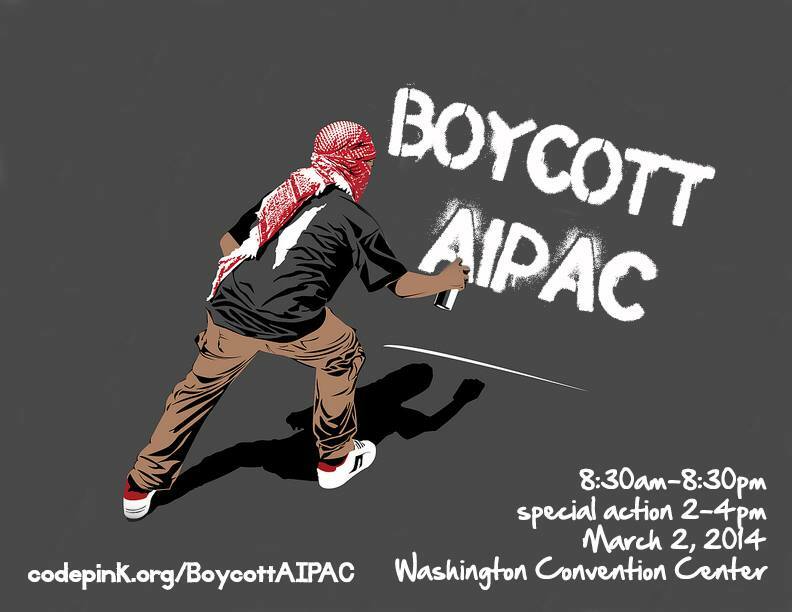 We hope you will join us to Boycott AIPAC! We are excited to announce that he will be visiting Iowa and Nebraska from Monday, March 3 to Thursday, March 6. 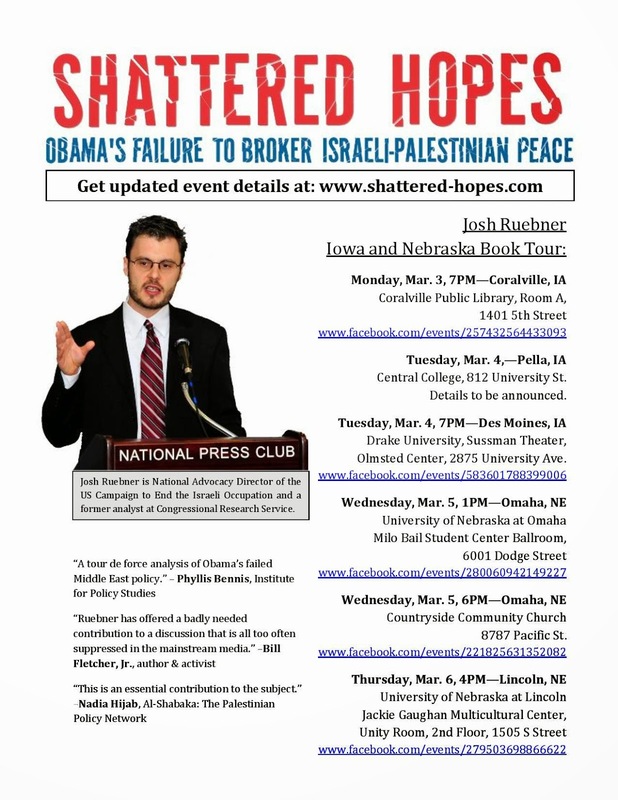 We hope that you can join him at one or more of the events he'll be doing-- at Coralville Public Library in Coralville, IA, Central College in Pella, IA, Drake University in Des Moines, IA, University of Nebraska at Omaha in Omaha, NE, Countryside Community Church in Omaha, NE, and University of Nebraska at Lincoln in Lincoln, NE. RSVP and invite your friends on Facebook to the events at Coralville Public Library here, Central College (details TBA), Drake University here, University of Nebraska at Omaha here, Countryside Community Church here, and University of Nebraska at Lincoln here. We are excited to announce that he will be visiting Kansas and Missouri from February 27-March 2. We hope that you can join him at one or more of the four events he'll be doing in Kansas and Missouri -- at University of Kansas, Watermark Books in Wichita, Keystone United Methodist Church in Kansas City, and an event in private home in Fairway, Kansas. RSVP and invite your friends on Facebook to the events at University of Kansas here, Watermark Books here, and Keystone United Methodist Church here. To RSVP for the private home event, email whitmoreandy@hotmail.com. And for additional information on Josh's spring book tour, see his website here. We look forward to seeing you there!